January | 2012 | George. Jessie. Love. In hindsight, this should not have come as a big surprise. This was not your standard issue little boy. Ever. With a love of dolls, wigs, dresses and a penchant for pink, purple and polka dots, George (n.c.i.) was, if nothing else, unique. Physically “all boy”, with a husky voice and a slightly lumbering gait, effeminate is never a word one would have used to describe him. Quirky, artistic, hilarious, rambunctious, impulsive and articulate: yes. Effeminate: no. Was he gay? (See Q&A below) Maybe. But give me a break – he was just a little kid. But he was always different from the other boys, including his older brother, Harrison. I knew the word transgender, but that was pretty much the extent of my understanding. I had no reason to know. It was a phenomenon reserved for other people, not me and certainly not my child. I was never against it conceptually, nor was I in active or outward support of people who identified as such. I was completely indifferent to it. Until, that is, my kid told me, with tears running down his face that his whole life he had wanted to be a girl. He (g.c.i*) was considerate enough of his mom to share this news in the company of his therapist who helped to clarify what exactly he meant and whether he wanted to be a girl or thought he was a girl. The answer was definitive: he was a girl. Let the games begin. Q: Were you shocked by this? A: No. And yes. See above. Q: How do you now he isn’t “just gay”? A: Gay is who you are attracted to. Gender is who you are. Could Jessie grow up to be a transgender lesbian? Yup. But I don’t think so. She wants a husband. One who will love her for who she is and not be “freaked out” by her having been born a boy. (Her words). Besides, can you think of any good reason a little boy would ever announce that he wanted to be a girl unless it was so deep inside that is simply had to come out? Q: How has school been? A: Incredible. Jessie’s (n.c.i.) therapist had beaten into my head that I am just a passenger on this trip. Jessie is the navigator. So when she was ready, she confided in a teacher at school. The teacher, in turn called me. (Aside: I have asked this before and will ask it again: why do they always call me?? Rich has a phone, too, ya know!) Within the hour we were meeting with the school principal and starting to formulate a plan. At the beginning we let things happen organically (Jessie went to pajama day the following morning wearing the entire sleepwear collection from Target)(and she entered the building with her head held high and not the slightest bit of fear or trepidation). A meeting was held for all faculty and staff and, about ten days later the principal and vice principal met with each fourth grade class to tell them the deal. The kids were sent home with a sealed envelope containing a letter for their parents which the administration happily worked with me to wordsmith to perfection. To date, there has been not one single negative reaction. In fact, both the administration and I have received numerous emails of support. Go Brookline! Q: What happens with the bathrooms? A: This is one of the trickier ones. At school, Jessie is using either the faculty or one of the two unisex bathrooms. When we are out in public she uses the ladies’ room and I remind her to sit. After she puts paper down on the seat. Q: How are Rich and Harrison doing? Q: Are you going to blog? A: I considered but decided against it. While my distribution list here has grown exponentially since going wide, I am still among safe people. People who are not going to judge, hate or criticize. That is where we need to be right now. Q: So, if I see you out with Jessie, what should I expect? A: Expect a delicious, brave, chatty little girl with hair that is not growing fast enough, two pierced ears with different earrings in each and, in all likelihood, wearing something pink. And you can tell her that you think she rocks. She kinda knows that she does. Q: Are you going to do the whole hormone thing? A: The protocol for the hormone therapy is four pronged. We have “passed” the first two levels: we have insurance and the social worker on staff thinks we are worthy of being passed along to their psychiatrist, which is level three and is scheduled for the end of February. If we “pass” that level, we will meet with the endocrinologists and take it from there. Jessie only wants to know if we can go to CVS and get the hormones already. Q: Well, more of a statement: “you are amazing” or “you are my idol” or various other accolades. A: As much as I relish the idolatry, I bristle at it, too. To a person, there is not one I can think of or imagine would not do the same for their child. You would be amazed what you can pull out of your hat. I am sure that there were other questions, but my head nearly exploded when the responses starting coming in after the announcement. It was truly overwhelming. This is the first (to some of you, about a dozen of you have been with this from the start) of what will be many conversation starters on Jessie’s journey. And while it is, indeed, her journey, I suspect it will change all of you, too. We all have different social circles that we traverse: childhood friends, college friends, neighborhood friends, the parents of our kids’ friends, church/synagogue friends, and friends from clubs or committees or, perhaps gyms that we have joined. We meet through commonalities of one sort or another and decided whether or not to pursue the relationship. I have friends that I met as a kid who (in part, thanks to Facebook) are back in my life, at least virtually. Along the way I have collected other parents that I care about (and, I think, care about me) from daycares, preschools, camps, elementary and high schools that my children attended. Sometimes we met through our kids, other times we found each other. Regardless of how we initially met we are all in a club of sorts. Some of them we chose. Some of them chose us. The first one that chose me was “The Breast Cancer Club”. Now there’s a club that no one ever wants to be admitted (invited?) to. It is also one that I joined (was recruited?) to which, odd as it may sound, I wouldn’t necessarily want to be kicked out of. Would I want to go through the whole experience again? No. But the people I met along the way from the doctors (whom I consider friends), to the patients I met while in the process, to the friends who supported me in more ways that I ever thought possible and finally to my ability (responsibility) to hold the hands of the women who travelled the road after me altered and effected my life forever. In fact, I recall hearing an interview with a newscaster who was back on the air for the first time since his own cancer diagnosis and treatment in which he said that it had been “the best year of his life.” I knew exactly what he meant. Next club to which I have recently been indoctrinated is the “parent of a transgender kid”. This one, while not life threatening or physically (for the most part) challenging, is not one that was ever on my or any of my other many circles of friends’ radar. I mean that not as a judgement, merely a reality. (The BCC always lurked in the recesses of my mind, since my mother had also been a member, but it never really occurred to me that I would secure a spot there.) So, here I am, quickly and fully immersed in this whole other circle of friends who have already become hugely important in my life. Which brings me to yesterday. I wore my signature outfit of jeans, a sweater, a cool belt and boots. Jessie stepped things up a bit and wore a dress, tights and her favorite black boots (yeah, the same boots that she iniitally rejected when I pointed them out…girls!). We worked together to make sure that her hair looked it’s best and off we went. The car ride there was overtly smooth, but we both felt anxious, each for our own reasons. Jessie, as is her way, bombarded me with questions for the entire thirty minute ride. “How many kids will be there?”, “will everyone be older than me?”, “are there going to be other transgirls?”, “will there be good food?”, “how are mountains formed?”. I don’t know, I don’t know, I don’t know, I hope so and, what?!?! We arrived at the house and were both relieved to see tons of cars out front. We were fashionably late (it was called for 10:30 but I left a little late for fear of being the first people there) and walked into a house full of club members – several of which I have started to get to know, some of which were newbies and some of which were part of the original group that found one another about ten years ago. As I entered I, fortunately, immediately caught the eye of one of the women who I had met prior to even attending a meeting through a mutual friend. A got a warm hello and hug and no sooner had I introduced Jessie did she ask, “where are all the kids?”. She was directed to the basement and my query as to whether she wanted me to accompany her was met with an eye roll, a toss of her bright pink jacket in my general direction and a “nope!” and off she went. I did not see her again until two hours later when it was time to leave. Last night I was just too tired (from worrying about who I haven’t told about Jessie) to make dinner. I gathered Jessie early (her choice, not mine) from extended day and headed to Comella’s around the corner. Their signature dish is called a “mess” which is basically a trough of pasta and whatever you want to add to it – we usually go for the meatballs. Having visited there with enough regularity to recognize some of the kids who work there (aside: these “kids” are in their twenties and once I realized that I could have given birth to any and all of them they started looking younger and younger) Jessie asked me on the way in if I thought “she” would be there. I knew exactly who she was referring to. “She” is a girl who works behind the counter, has a contagious and constant smile, a beautiful manner, a long mane of black curly hair in a huge ponytail and only one arm. The first time we ever saw her I was with both my kids: I noticed her smile, George (n.c.i.) noticed her arm and Harrison noticed just how adorable she was. Suffice to say, she made an impression on all of us. We entered the store and, alas, there she was, off to the side joking around with the other employees. As I was giving our order to the awkward boy behind the register I heard Jessie (n.c.i.) asking (whom, I am not sure) if she could know more about the arm…in particular, how does she put all that hair into a ponytail with just one arm. Register boy was getting flustered trying to take my order and shut Jessie up at the same time. Once the order had been placed, register boy shook his head and whispered, “don’t ask her!” in a manner which was sweetly protective yet seemed somehow inconsistent with the read I got on the girl herself. As we stepped away from the counter and knowing we had twenty minutes to wait for our dinner to be ready, I motioned to the girl to come over. With that beautiful smile she did and we moved, en masse, out of the way of the onslaught of other lazy mothers coming in to get dinner for their families. I started by telling her that “my son (oops, I still do that sometimes), I mean, daughter, has some questions about your arm. Is it okay if she asks you?” As I fully expected, she said of course and introduced herself to us as Christina. She asked Jessie her name and there was a sparkle between them which was palpable. They proceeded to chat comfortably and honestly about what it is like to have only one arm (which, incidentally, doesn’t slow her down in the least. Remember, I didn’t even notice it the first time we went into the store!) and Jessie asked the most burning question on her mind: “how do you do that ponytail?!? !” With a laugh and a smile, Christina told her that she was really lucky because her parents (aside: she was adopted from Greece as a baby. When her birth parents saw her “deformity” they gave her up) always told her that she could do anything and be anyone whether she had one, two or three arms. She said how lucky she was to have been chosen by her adoptive parents. Jessie looked at me, looked at Christina and said, “I know, right? My parents are the same way!” (Have you grabbed a Kleenex yet?) I looked at Jessie and asked her if she wanted to tell Christina what is special about her. Without hesitation she said she did and proceeded to tell Christina that she is a transkid. Now the roles were reversed and Christina was the one inquiring about how Jessie manages and when she knew, and how it felt. I almost felt like an intruder in this candid yet wildly intimate conversation being had in a place that prides itself on it’s “mess”. Once our food was ready we said our goodbyes knowing that a certain bond had just been established. Two kids who will always be different but are just plain happy. When George (n.c.i. *) first came to us in September and declared his deep desire to be a girl we, with the exception of our most intimate relationships , kept it under wraps. We did so for many reasons: shock/fear/anxiety, hoping for a little bit of time to create a new reality, wonder over its “legitimacy” and, frankly, ignorance as to how to move forward. In our numerous consultations with his therapist the recurring message was that we were just along for this ride and the lead was not ours to take. No sooner had those words been uttered than George (again, n.c.i.) made the announcement (without our knowledge) to one of his teachers at school. That day has heretofore been referred to as the day that the cat was out of the bag. It was December 12, 2011…the day after Jessie’s (n.c.i.) birthday. Profound, right? Now thrust into a point of no return we started with the first of what would become numerous meetings with administrators, teachers, psychologists and guidance counselors at the school in an attempt to work together in a timely (but not knee jerk) manner and figure out how to work with and disseminate this new information in the least chaotic way possible. It took countless conversations, phone calls, consultations with anyone who knew anything, letter writing, wordsmithing and scripting but in the final hours of a Friday afternoon in the fourth grade, the classes were each met with and told that George was now Jessie. That day is known as the day that horse was out of the barn. So here we are now, about a month since the official announcement at school and everyone in the community who knows about the change has taken it in and moved on to whatever they have going on in their own lives. The initial shock is gone and, while I am sure there is chatter on the playground and at the local Starbuck’s, the transition has been shockingly seamless. So the worst (in terms of letting people know) is over. Right? Wrong. Every single day, assuming I leave the house (which I do. everyday) I am burdened with a concern over who I might bump into that falls into any number of different categories: they don’t know (but wonder why George (n.c.i.) is next to me dressed in pink and has hairclips to match), or they’ve heard something but don’t know officially, or they know but are too awkward or embarassed to bring it up, or is a person I have known for years and is not anyone that I feel I need to tell, but somehow I do. This happened just the other day. I was at gymnastics class and saw a woman I have known since childhood but see primarily on Facebook. She knew all about George (n.c.i.) from my various status updates quoting him and his ongoing hysterical banter and impressive works of art. She even commented on what a funny son I had. All the while I am growing increasingly anxious with the knowledge that Jessie (n.c.i.) is about to come bounding out of the class, hairclips hanging, sweat dripping and elation oozing leaving me with some explaining to do. Feeling no other option, I, as matter of factly as possible, brought her up to speed. Because transgender stuff is so fraught with emotion, I had to make a conscious effort to keep it short and sweet which, of course, I failed at miserably. Twenty five minutes later, with my arm being tugged by a certain ten year old who was ready to go home, I was still in conversation with a perfectly lovely woman who never, in my wildest dreams, would be on my short list (or any list, for that matter) of people I felt a need to share this information with. Yet there I was. All this brings me to my latest burning issue: the cat sneaked out of the bag and the horse barreled out of the barn. Is it time now to go fully wide and officially blog about this? My initial email distribution list started off with under a dozen people and is now north of fifty yet there is something holding me back. Some of my most trusted advisors have weighed in about tossing this out there for public consumption, yet I remain conflicted. Any and all opinions are welcome. 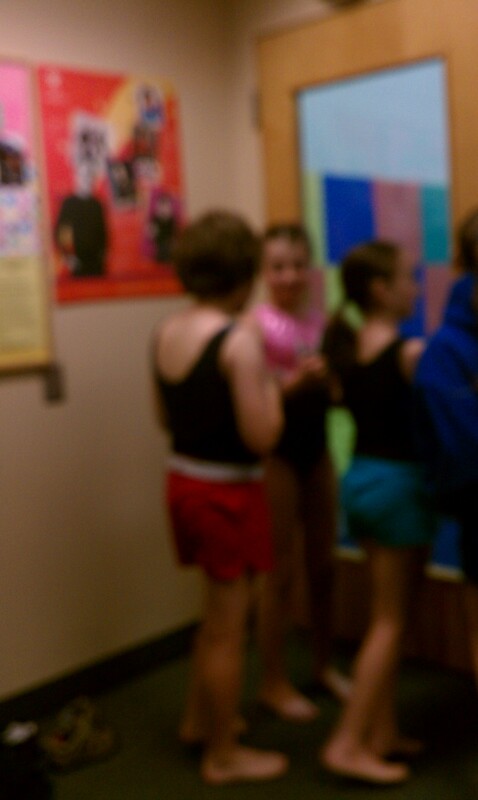 Finally, here is a blurry picture (people kept walking in front of me and then Jessie caught me about to take it so turned away, wrecking the fantastic moment) that I took yesterday at gymnastics. That is Jessie (with her back to the camera. Stinker), hanging with two other girls waiting for class to start. The girl in pink had just greeted Jessie with a “hi, Jessie..I like your hair that way” making her my new hero. A small, but happy moment. “I don’t care if you are a boy, a girl or a martian” I barked at Jessie. And, despite how unpleasant and rude it may sound, it was actually a moment of pride for me. Having gotten so wrapped up in this whole transgender announcement had depleted me of my already lax parenting habits lately and now I had, in a strange way, experienced a brief moment of normalcy. George (name choice intended) was never what anyone on God’s green earth would ever call easy. Impossible: yes. Exhausting: yes. Frustrating: yes. But easy: no. Never. While always charming, engaging, talented and funny as hell, just being with him was a challenge. It proved too much for many — his first daycare provider literally called me at 11 in the morning and told me she simply couldn’t handle him for one more moment. The first therapist I took him to spent more time chasing him as he bolted out of her office than doing any sort of psychological assessing, let alone “fixing”. His camp counselors didn’t even attempt to talk to me, rather they escalated to the director and let him handle it. (Suffice to say, he never went to the same camp two summers in a row.) When I went to sign him up for the second session of a cooking class at the school enrichment program I was literally chased after and told that he wasn’t really welcome in there again. Need I go on? Over time it turned into a game of survival (mine and his). His intensity literally wore me down to a stub. Ever the smartest person in the room, Jessie (name choice intended) has not only shown great relief at her having come out to us as transgender, but has also opted for working it in her favor at every turn. From when she told us in September until she went wide in December, Jessie referred to her desire to be a girl as “the secret”. With close support from her therapist, we let her take the lead and allowed her to decide when, where and with whom she would share. In those four months, there were countless times that she would be rude, or obnoxious, or bratty, or vile or generally unpleasant and then, with doe eyes, blame it on the burden of the secret. And I, being beaten down, overwrought and exhausted, would give her a pass. (In all honesty, I have been giving her a pass for years. My bad.) My head was spinning and my heart was breaking for fear of what lay ahead for her (and, frankly, me) so did it really matter that since she was so burdened with her “secret” that she couldn’t do her homework? Or clean her room? Or brush her teeth? And then, one day, (because, as anyone who has ever been on this kind of journey will attest no two days, or hours, are ever the same) when she tried to weasel out of something I suddenly got dope slapped (figuratively, thankfully) and pulled on my big girl pants and told her “game over!”. And while the dance is still in motion, I am starting to be reminded of the fact that Jessie is just a ten year old kid. A much happier, prettier and better dressed kid, but a kid nonetheless. She is a child in transition, not in crisis. Her crisis ended when she made her announcement. My need to dance around her and go to any and all lengths to keep the peace, while a deeply formed habit, isn’t necessary anymore. So there’s my “secret”. I was so fearful of making a miserable child more miserable that I abandoned everything I might be bold enough to suggest I knew about parenting. My small victory was laying it out and telling her that the passes were going to be fewer and further between. The love won’t be, but the passes will. Yesterday, while doing a video diary with Jessie I asked her what she wants me to do with her old clothes. She said she had been thinking about it and (get ready, this is a good one) she wants to make them into a quilt. I, of course, loved this idea. It gets better. She wants to donate it to someone who doesn’t have a loving home like she does. Much as I loved the idea, I kinda, sorta, well, okay, really want that quilt for me. Thought I would share what I considered a special moment. Once we’ve given birth and been told “it’s a girl!” or “it’s a boy!” (which, by the way, can sometimes be a lie) we’ve usually prepared a nursery for the baby to live in over the next couple of years while they are in a crib. For us, the nursery remained empty for the first few weeks while our babies slept in a bassinette in our bedroom making the middle of the night calming and feeding just a little easier. It was a nice time to have the baby so nearby and even allowed for marveling at this little life…even if was three in the morning. Once the initial homecoming haze lifted, off to the nursery. Momma needs her sleep. With Harrison, we kept him in our room for a fairly long time. Just how long I haven’t a clue. He was our first child, it was seventeen years ago and a lot has happened since then. Suffice to say, it was longer than we did with George (name choice intended). Part of that was the first baby/second baby phenomenon and part of it was that George was, without competition, the easiest baby ever. This was in stark contrast to Harrison who, well, wasn’t quite so easy. (Note: he is now. How that little monster baby turned into the menschiest guy I know remains a mystery). 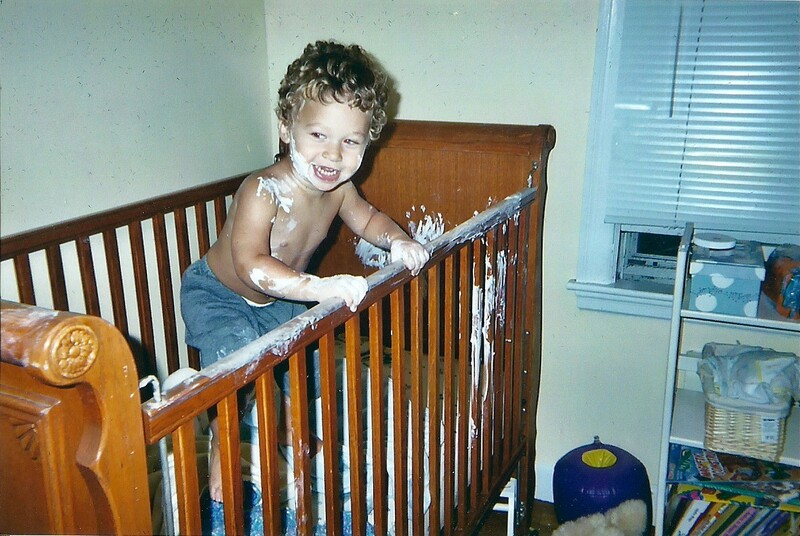 It was much sooner in his life that George flew the coop and was off in his own room, happily singing, laughing and, on one particularly memorable afternoon, decorating the room in Desitin. Once he had moved out and because we knew this was going to be our last child, we felt as though we had our bedroom back for good and could at least attempt to consider it a sanctuary of sorts. Neither of my children were of the “climb into bed with us” variety. Group television watching was done in the family room and sick children stayed in their own beds. It wasn’t that our room was off limits, rather is just never became the cool place to see and be seen. Through all of the stresses (many), tantrums (mostly George’s but a few of my own) and tears (at some point everyone) I could always (eventually) shut and lock (okay, I don’t really have a lock, but God help the person who dares to come in when the door is shut) the door seeking (usually in vain) my sanity. Across the hall, Jessie’s room is full on girl. I challenge anyone to display as much pink, purple, flowers and polka dots in one place. From ripping off the G E O R G E letters that had been adorning the door since birth (a scene Harrison caught on video) to covering the blue carpet with pink throw rugs, all signs of George are gone. But all the clothes and remnants of George, from boxer shorts to soccer shorts (never played the game for even a moment. Instead, there were dolls to be dressed, combed and re-dressed) are now, as the attached picture shows, in a heap next to my dresser. A heap which has immobilized me. A part of me wants to go through and pass them along to younger boys in our life. Another part of me wants to load them into the trunk of my car and bring them to Goodwill. There is also the urge to pack them away somewhere in the house…”just in case”. But the most profound part of it (and I cannot take credit for this revelation) is that my child is back in my room. My ten year old girl, who not so long ago was my nine year old boy, is, in part, back in the comfort of my room. And I do wake up at three in the morning and look over at the pile with wonder. And confusion. And, frankly, fear. Here I have this pile of clothing (which, incidentally, has not been revisited or given a passing glance by Jessie once…not even for a broken in t-shirt or sentimental sweatshirt) which I have visions of being there for years to come. I don’t think it is hurting anyone (the aesthetic of my room, perhaps, but no people have been harmed) yet it feels somehow unnatural. And while Jessie seems very much like Jessie (as opposed to George) I still find that pile disconcerting. 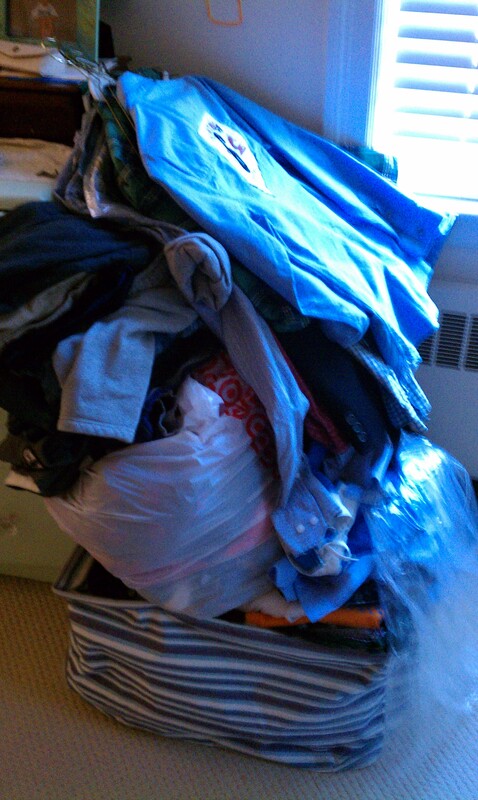 Until such time as I am able to make an adult decision around the pile, I suspect it will stay right where it is. I am sure there will come a day when, without much fanfare, I somehow make it go away. That day is not today. And probably not tomorrow, either. As with every day since our family’s transition (trust me, it is not just a George –> Jessie change), both yesterday and today were loaded. And yes, I cried each day. Shabbat services at my childhood synagogue for my father’s yahrzeit. Just reading about the day that lay ahead made me want to crawl back under the covers. Well, I wanted to climb under the covers after the 9:30 appointment, but I wanted to climb, nonetheless. Jessie felt quite strongly that she wanted to wear a dress to services. I suggested some cute pink pants with a cute top (cute is a big word in my house suddenly) but she was having none of it. Fair enough. We found a key parking spot (for the uninformed, I am famous for my parking karma) and head directly to the junior department. As I pore through the sale racks looking for casual dresses, Jessie makes a beeline for the cocktail dress section. (Why there is an enormous cocktail dress section in the junior department is just one of the many things I need to learn). And, like a seasoned tween girl, she pulled a dozen in her size (which, yes, she already knows) and skillfully draped them over her arm and headed toward the dressing room. Stop right there. In a few more years, when we are in Bar/Bat Mitzvah season, we might consider one of those dresses, but, newsflash: “you are ten!” It became immediately clear that a hissy fit (hers, not mine) was on the horizon and I actually heard myself say to “you will try the ones that I pick or you will get nothing little miss.” Wow. That was weird. Serving as a reminder that Jessie was, not so long ago, George, the first fitting rooms were rejected due to the posse of 13 year old girls who were having a bash of sorts and were dodging, half dressed between rooms. Again, fair enough. Once we found a more acceptable room, Jessie tried on all four dresses I had brought in. They all looked adorable. So, despite my pronouncement that we were buying ONE dress, we bought all four. Then, being a girly myself, I deemed the cute brown boots she had on to be “not quite right” with the new dresses so offered to see if there was anything on deep sale in the shoe department that might work. I spied a pair that I would wear myself (note: I am secretly kinda looking forward to the day her foot and mine are the same size) and suggested she try them. Initially rejected on sight, I whispered to the salesman to bring us her size. Yeah, well of course they were perfect. And $35. I am quite sure they are made of paper, but who cares. The service for my father’s yahrzeit always does me in, but this year was particularly brutal. When the Rabbi announced a two minute moment of silence, by brother leaned over to me and asked if this was going to do me in. I told him that it was only the second minute and forty five seconds that I thought might be my undoing. And right I was. I quietly wept through the remainder of the service and considered it a small victory that my mascara did not betray me and was not only mostly intact, but was also not running down my cheeks. That is never a good look. A larger victory was the woman who, following the service, put her hand on my shoulder and told me that she had been watching me throughout the service. Assuming it was due to my raw emotions I smiled demurely only to be set straight when she finished her sentence and told me that she was admiring my excellent hair cut and color. Welcome to my crazy world. As we do each year, the family then headed for dinner and drinks (not in that order) at a nearby restaurant. This year we got smart and had the licensed children bring their own cars so that they could feed them and they could leave with the little kids. We did (feed them) and they did (leave) and we continued with libations and conversation. Not surprisingly, the conversation centered around Jessie and the conclusion was that we were all witnessing a much happier child than we had before. Biggest victory. A decidedly less serene Jessie in our midst. (This could have something to do with the fact that when we returned home after midnight, she was wide awake and watching t.v.) For the first time since her social transition, Jessie became hysterical, complete with real tears, over her need to acquire a retired American Girl doll named Mia. Retired American Girl dolls are a brilliant marketing campaign — stop selling the dolls (which start at $100) and make them rare and, apparently, valuable (and I use that term loosely) by selling them on Ebay for north of $200. This went on for hours. Literally. The upset and tears were so intense and genuine that I knew something else was up. The thousands of hours of therapy (hers and mine) have taught me that this need for a doll wasn’t really about a doll. Jessie, too, finally, through tears announced, “I know this isn’t about the doll. I don’t know what it is about though.” I found this both a relief and a worry. What now? Are you regretting your decision to become Jessie? (NO!) Are you being teased? (NO!) Is this happening too fast? (NO!) Do you miss George? Silence. Then a long, hard hug and a “thank you”. Then I started to cry. And, like we did the day she told me her “secret” we rocked together in tears silently assuring one another that everything was going to be okay. And silently acknowledging that George doesn’t live here anymore. Jessie has bounced back. While she still wants us to consider getting the doll, she is back at peace. For now. Her mother, however, is done for. For today. Yesterday Jessie took her first gymnastics class as a girl, with girls. Girls who didn’t know (or care) that Jessie has boy parts. Out of respect (and a healthy dose of anxiety) I had made sure that the teacher knew the reality of the situation and waited with bated breathe when the class ended to see how things had gone, both for Jessie and, frankly, the teacher, Laura. Much to my pleasure, both came out over the moon. Jessie, a bright red mass of sweating child with the cute hairclips meant to both hold back the hair and feminize her (ever so slightly) hanging on by a single hair, was elated and only wanted to ensure that I had followed through and handed over the cash to hold her spot. Some call it a mortgage payment (really? $400 is the pro-rated amount?) , but it was worth it. Laura, who I have to believe was a bit trepidacious going into class (I know I would have been)(wait, I was) had a smile just as wide as Jessie’s. Ever the worrier, I quietly and privately inquired as to whether the other girls seemed to notice anything different about Jessie and Laura emphatically assured me otherwise. While Jessie still looks, in many ways, like Georgie, it didn’t entirely surprise me to hear this. It thrilled, but didn’t surprise me. p.s. I am finally finding writing about this helpful to me. (For a while there it was impossible for me to write a check, let alone anything of meaning) (And yeah, part of the reason I couldn’t bring myself to write a check was, well…never mind. That’s a whole different blog) If you are finding it annoying, cumbersome, boring or otherwise irritating, please please please let me know and I will stop sending them to you. I figure this is better that eating, drinking or shopping away my feelings. Three what you ask? The three happiest days of Jessie’s life…all in the past month. 1. The day she discovered, thanks to the article in the Globe, that “she wasn’t the only person in the world who felt this way”. 2. The day we went on what I can only assume will be the first of many shopping sprees at Delia’s. 3. Yesterday – the day she took her first girls’ gymnastics class.